Falcon Electrical design and install a huge range of electric gates in Doncaster and throughout the South Yorkshire regions. One of the principle components of electric gates is the quality of the motors that drive them and how well the electrical side of the gate installation has been handled. Clearly we are at an advantage to most other gate installation companies as we understand each part of the installation process perfectly and keep the electrical side of our knowledge up to date with the new regulations, delivering quality gate installations that will last and that are perfectly connected and isolated (Circuit Breakers) within your distribution board. Choosing the style of your gates can be governed by the amount of opening or sliding space you have, sometimes coupled with how flat the land is. We can quickly advise you on the the variety of options and styles available together with materials and colours. 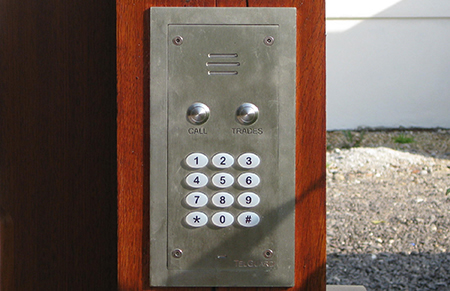 Electric gates can be activated by intercom keypads or key fobs or both, but mostly both. Tying in your gate system to your overall security solution (Intruder Alarm & Intercom) can be an exceptional integrated solution, delivering a fully interfaced solution. Dependent on a variety of factors, compatibility, age etc, may enable that we are able to add to your existing security system; which if possible can deliver significant savings. Assuming that opening space is an issue, or your drive has a steeped entrance, or is close to the roadside, choosing a sliding gate maybe the perfect solution. These features coupled with the fact that outward folding gates can open directly onto a vehicle if they are unaware of the clearance space required when the gates open. If your driveway has sufficient outward opening room, this style of electric gate, offers the most aesthetically pleasing solution. Outward opening electric gates have a pivot point connected to a motor on each gate, these then power the gates to open and close on command, with a override safety sensors should the gate start to close at the same time someone has just crossed the sensor threshold. Falcon Electrical are a Doncaster based company specialising in many services, all of which are electrical at their core. Please feel free to call for some advise or to book your appointment.